The StingRay Special 4H in Hades Black, St. Vincent HHH in Turquoise Crush, and StingRay 5HH in Giants Orange Quilt. The Ernie Ball Music Man calls its Ball Family Reserve series "a celebration of the company's heritage in instrument craftsmanship." And truly, these rare pieces are a site to behold. 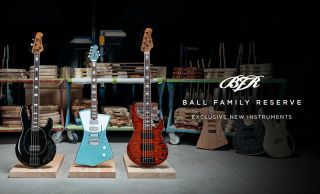 Offered in limited production runs, the BFR collection allows Ernie Ball Music Man to present instruments to the public that were previously reserved for family and artists. April's collection features the StingRay Special 4H in Hades Black, the St. Vincent HHH in Turquoise Crush and the StingRay 5HH in Giants Orange Quilt. You can find out more below. To find out more head over to music-man.com/bfr/april-2019.